Saint Elizabeth of Hungary, Religious - My Catholic Life! The marriage of today’s saint was not any less happy for being arranged. 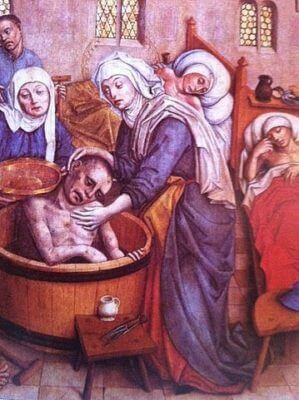 Elizabeth of Hungary’s parents betrothed her at the age of four to a young German nobleman named Ludwig and sent her away as a child to live in his family’s court. Elizabeth wed Ludwig when she was fourteen and he twenty-one. Only in a post-industrial age have the teenage years been understood, in some countries but not all, as a time of self- discovery, boundary pushing, and rejection of tradition. Puberty has historically been understood as the passage to adulthood, responsibility, and a professional life, not as a gateway to, and excuse for, total confusion. It was typical of her era, and many other eras, that Elizabeth would marry at fourteen. She was ready and became a contented, serious, and successful wife and mother, bearing three children, while still a teen. Before Ludwig left on Crusade in 1227, he and Elizabeth vowed never to remarry if one were to die before the other. Then Ludwig died on his way to the Holy Land. Elizabeth was distraught but fulfilled her promise. So at the age of twenty, her already pious and prayerful soul waded into deeper Christian waters. Her mortifications became more rigorous, her financial generosity more total, and her prayer time more all consuming. Most of all, Elizabeth’s life now began to revolve almost uniquely around the poor, the aged, and the sick. She opened a hospice near a relative’s castle and there welcomed anyone in need. Elizabeth also fell under the spell of a charismatic and over-bearing spiritual director who insisted that she make the most severe emotional and physical sacrifices in her quest for perfection. As a sign of her commitment to the poor, and to aid her in conquering herself, Elizabeth took the habit of a Third Order Franciscan in 1227. Franciscanism was spreading like wildfire throughout Europe, and Elizabeth was not the only noblewoman far from Assisi to be drawn to the message of Saint Francis so soon after his death. A native Hungarian, who came in search of Elizabeth in Germany at this time, was shocked to find her dressed in drab grey clothes, poor, and sitting at a spinning wheel in her hospice. He begged Elizabeth to return to her father’s royal court in Hungary. She refused. She would stay near the tomb of her husband, stay near her children, now in the care of nuns and relatives, and stay close to the poor whom she loved so much. Most likely worn out by her austerities and near constant contact with the sick, Elizabeth died at the age of twenty-four on November 17, 1231. Miracles were attributed to her intercession soon after her death, and testimonies to her holiness were collected so rapidly that she was canonized by the pope just four years after her death. In 1236 a shrine was dedicated to her memory in Marburg, Germany, and her remains were transferred there amidst great ceremony. Pilgrims continued trekking to her shrine throughout the middle ages until a Lutheran prince, full of dissenting Protestant spit and vinegar, removed Elizabeth’s relics from her shrine in 1539. They have never been recovered. Saint Elizabeth of Hungary, we seek your heavenly intercession on this, the date of your early death. Help all young mothers to persevere in their vocations, and all young widows to not be despairing but confident as they walk forward in life alone, knowing that Christ is at their side.